While Apple highlighted the A9 and M9 chip combination as what makes "Hey Siri" possible on battery power in the iPhone 6s and iPhone SE, the 2017 fifth generation iPad with the same chip combination lacks the ability. Though the new iPad launched in March, the lack of always-on "Hey Siri" support has gone largely unnnoticed Absent even on the A9X powered 12.9-inch iPad Pro, the only iPad model the feature is currently available on is the 9.7-inch iPad. The absence is confirmed by a note in the fifth-generation iPad's Settings menu, which states the feature is only able to be used when the iPad is plugged into an external source of power. Always-on "Hey Siri" was first introduced with the iPhone 6s and iPhone 6s Plus. Apple claimed that the feature was made possible by the special low-power processing of the M9, which allows "Hey Siri" voice controls can be invoked without touching the device or plugging it in. It remains unknown why Apple hasn't added always-on "Hey Siri" support for the 12.9-inch iPad Pro, and Apple has not responded to requests for comment about the situation. 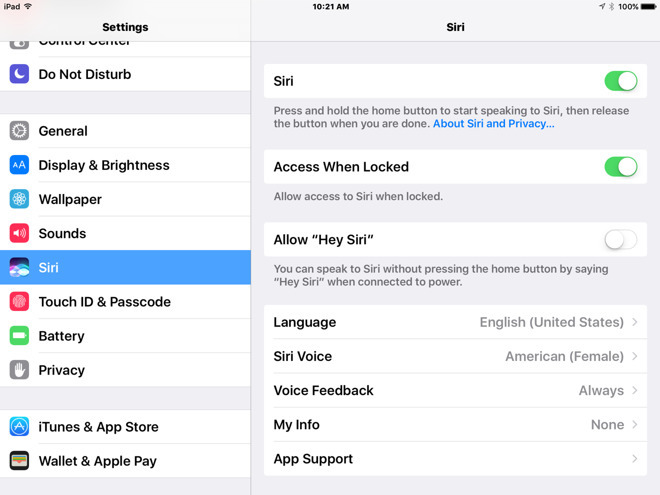 Beyond the iPhone 6s series, iPhone SE and 9.7-inch iPad Pro, the "Hey Siri" command can also be used with the Apple Watch, but users must first raise their wrist to activate the screen before speaking.